Taking the FE or PE exams? Come to an information session April 23! Are you planning to take the Fundamentals of Engineering or the Principles and Practice of Engineering exams? Attend this information session to find out more! Who should take these exams? Note: Do NOT record or live stream the information session. Learn more from the National Council of Examiners for Engineering and Surveying. 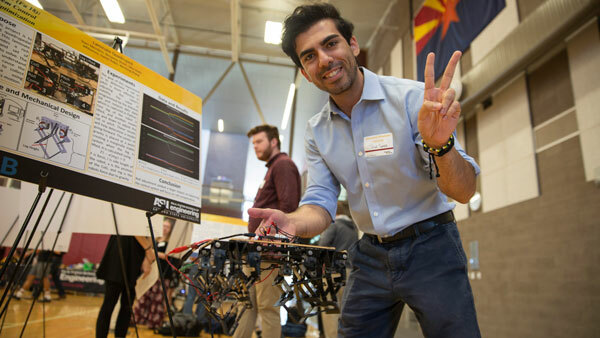 ASU will host a special guest invited by President Crow, Amory Lovins, Rocky Mountain Institute Cofounder and Chief Scientist on April 24–25. During his visit, Lovins will give two Global Futures Special Seminars on energy. Refreshments will be served at both lectures. Oil suppliers have more unsellable than unburnable oil; they are more at risk from competition than from climate regulation. 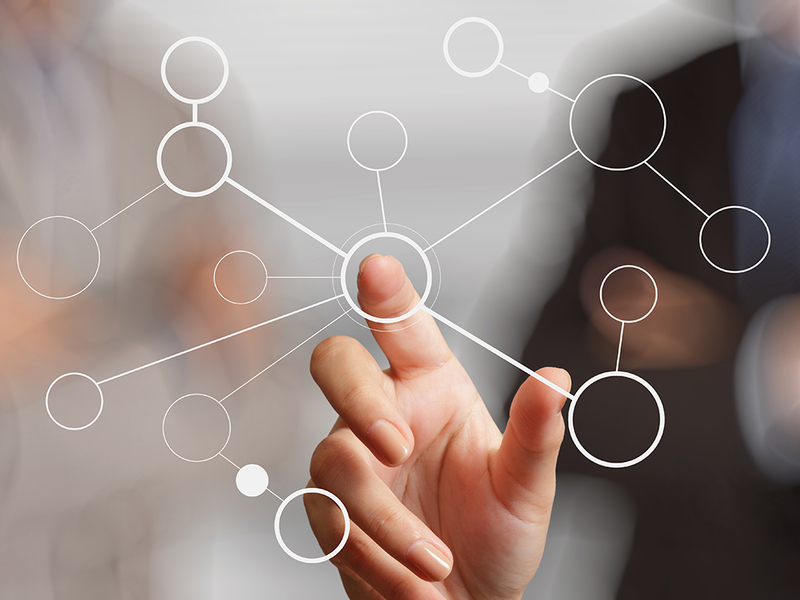 Electricity suppliers too face a swarm of disruptors that will transform their business beyond recognition. As these two vast industries merge and as insurgents in both challenge incumbents, almost everything we thought we knew about energy is ripe for rapid and profound change. Energy efficiency is traditionally viewed as a pile of separate technologies to be added in order of increasing cost. Yet designing buildings, vehicles, and factories instead as whole systems can save several-fold more energy at several-fold lower cost. Examples spanning all sectors and virtually all applications even show that such “integrative design” can often make savings cost less as their quantity grows. Countries still building much of their infrastructure can more easily build it right than fix it later, so integrative design offers an extraordinary opportunity to stretch capital budgets by leveraging enormous supply-side savings. Check out creative solutions to real-world problems this Friday, April 26, 2019! A new pilot program, the Rising Dissertation Institute (RDI), is available for underrepresented (African American, Native American, Pacific Island and Hispanic) students who will begin a doctoral program in Fall 2019. This four day interactive workshop grew out of the successful Dissertation Institute (DI) that has been running for the past two years. The 2019 RDI will take place on Sunday, June 23 through Wednesday, June 26, 2019 on the University of California, San Diego campus. The Institute is funded by the National Science Foundation and hosted by Old Dominion University and Virginia Tech. This is the last week of the semester. I know how busy (and stressed) you are. It’s one assignment and/or project after another with deadlines getting closer and closer. I reached out for help to compose the “career tip” for this week. 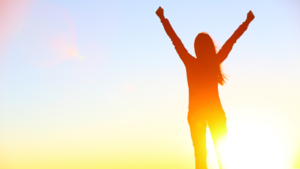 I hope that you find encouragement from the following motivational quotes. 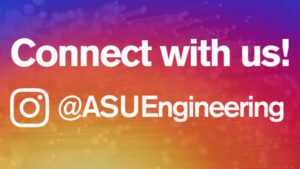 Did you know you can use Handshake to search job opportunities and internships, upload your résumés for recruiting employers to view, schedule on-campus interviews and see who’s recruiting at engineering career events throughout the year? If you’re not taking advantage of this resource, register for Handshake today. Exponent is holding a career event on Thursday, April 25, 2019! 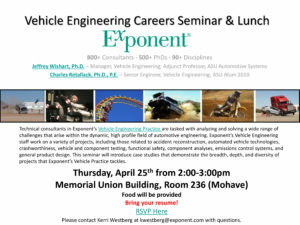 Come learn about vehicle engineering and upcoming career opportunities. The event will be in the Memorial Union Mohave room 236 from 2–3 p.m. and there will be food provided. Don’t forget to bring your résumé! Check out the flyer for more details. 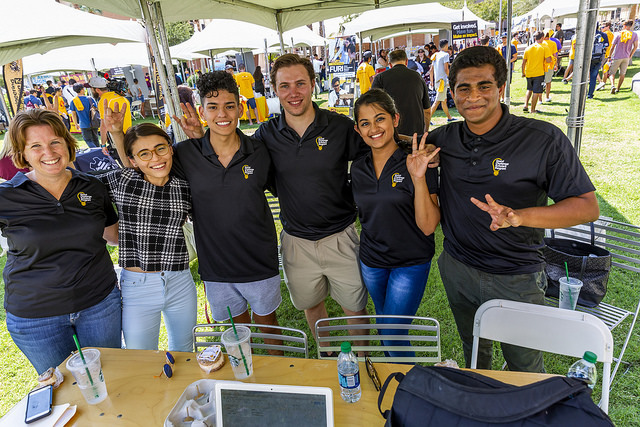 The ASASU Council of Presidents is accepting applications for student positions on many university boards and committees across all campuses. Review a list of available positions and apply online! 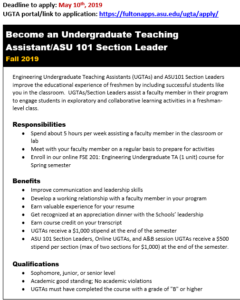 Both undergraduate and graduate students from all ASU campuses are encouraged to apply. Supplemental application materials (résumé/unofficial transcripts) must be submitted to dan.ashlock@asu.edu. There is a shortage of students able to serve on the University Hearing Board during the summer – if that interests you please consider applying. Review of applications will begin immediately and continue until all positions are filled. Thunderbird for Good, the nonprofit that functions within the Thunderbird School of Global Management, has a variety of programs that help women entrepreneurs all over the world! 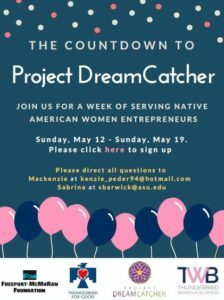 This May, Thunderbird for Good is working on its DreamCatcher program and we’re looking for volunteers. From Monday, May 13, 2019, to Sunday, May 19, 2019, in downtown Phoenix, Thunderbird for Good will be hosting Native American women entrepreneurs for a week of mentoring, business classes and networking opportunities. Are you looking for volunteer opportunities for your organization? Are you still in need of dean’s funding points? Please consider volunteering on behalf of your org and feel free to share this with your networks.